Building on the success of the 2017 debut, the 2018 Horsham Americarna event was twice the size…this video shows just a little bit of what was happening on the day! Focusing on classic and modern American automobiles, the returning event celebrated all things American with an emphasis on the vintage as well. Following on from last years video which featured the fictional Symes family, our brief this year was to capture the event as it was, showcase the range and breadth of cars involved, get vox pops with members of the public, car enthusiasts, display teams and more to help tell the story of the event and why people have enjoyed their day so much. 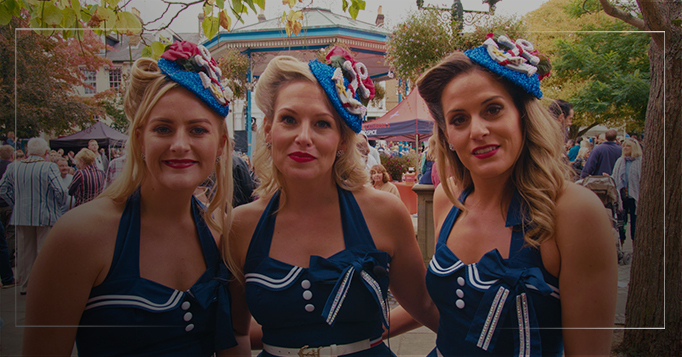 Our particular favourite vox pop was with female vocal trio The Spinettes who came up with an Ameri-Car-Na song on the spot – watch till the end of the video to see this! We covered the event as three units shooting specific content – Geoff gathered vox pops and general event coverage, Mike focused on the cars and retailers and Glen did general coverage with his gimbal system. This was the best way to ensure we didn’t miss anything as there were cars, retailers and activities in almost every area of the main town centre and adjacent spaces. We initially edited a short teaser trailer to thank everyone who attended the event and those who exhibited cars there too. After the release of that video, this full show video came out which is the one on the page here.